Philip Gamblen was born in the UK in 1964 and immigrated to Canada with his family in 1966 where he resided until 1989. During that time he trained and worked as a gem cutter in Toronto during the 1980’s. In 1991, after two years of travel, he moved to Australia and re-settled near Perth, WA where he presently resides. He graduated from the Claremont School of Art in1996 and Curtin University of Technology in 1998 with an Honours Degree in Fine Art, majoring in sculpture. Since graduating Gamblen has been concentrating on his art practice as well as working in collaboration with others. Most of his work is generally kinetic in form and involves the use of simple mechanisms and electronics. He has been increasingly using robotics in his artwork and has been refining his skill in machine making as well as electronic control systems. Gamblen is an Honorary Research Fellow at the School of Anatomy & Human Biology, UWA, and has worked as an artist in residence in SymboiticA – The art & science collaborative research lab since 1999 where he has been collaborating with other artists and scientists on biological based art projects. The 2 most significant of these, “MEART – The Semi-Living Artist” (www.fishandchips.uwa.edu.au), has been exhibited in numerous exhibitions and festivals nationally and internationally in the past six years. In 2006 Gamblen was a research fellow at the Steve Potter Neuro-Engineering Lab at the Georgia Institute of Technology, Atlanta. He, along with collaborators Guy Ben-Ary, Douglas Bakkum and Dr Steve Potter, developed Silent Barrage that has recently been featured in NYC and Ars ELectronica. 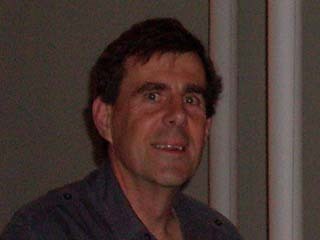 Peter Gee Born in 1957 in the farming community of Wongan Hills, Western Australia, Peter Gee moved to Perth in 1976 to study electronic engineering. Making a career as a technical specialist in Stored Programme Control in communications with Australia’s Telstra Corporation, he now works as a data analyst/programmer in the management of IP networks. Peter Gee is a relative newcomer to the evolution that has become Silent Barrage. Joining the team in 2008, Peter brings with him a long history in communication and networking software development. Enjoying family life, Peter is married with two high school aged children. Along with interests in solar design, wood and metalwork, his long term hobbies of electronic design, microprocessor/microcontroller hardware and software development have led him toward Silent Barrage. Riley Zeller-Townson was born in Portland, Oregon and spent most of his life at the coast of North Carolina drawing up designs for animals he intended to build. He graduated from North Carolina State University with a dual Bachelors in Biomedical Engineering and Computer engineering, and a minor in Zoology. Now he’s working on his PhD in Biomedical Engineering at the Georgia Institute of Technology, in Dr. Steve Potter’s lab. Riley’s research interests include inducing directed plasticity in cortical cultures, development of the neocortex both inside and outside of living organisms, and computer models of neocortical function. Outside of lab he enjoys running and volunteering at the Georgia Aquarium. 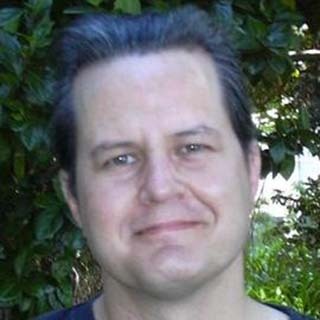 A/Prof Nathan Scott BE (Mech) 1987; PhD (Engineering Education) 2006. My family were people who built their own houses and fixed their own cars, so Mechanical Engineering was a natural choice for me. I get a great deal of pleasure from design work, especially where I can invent something that is cheaper or better. I teach design and manufacturing in my School at UWA. I also lead many student projects each year, many with a humanitarian or ecological flavour. For example in 2009 I had thirty students designing a bike for a boy born without arms, and three students working on the “waste for life” project. My research has been mainly about student learning in dynamics but in recent years I worked on measurement of ski athletes in Japan. I am an advocate of problem-based and project-based learning and will be the first director of the Monadelphous Integrated Learning Center when it opens in 2010. My contribution to the Silent Barrage installation was mainly to guide the design towards mass production, and I also designed and built all the circuit boards. 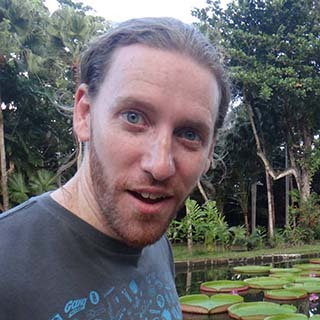 Brett Murray Murray is a composer and programmer interested in interactive and cross-disciplinary works. He has a Bachelor of Communications (Photomedia, Film and Video) and a Bachelor of Music (Honours) (Music Technology) from the Western Australian Academy of Performing Arts. Dr. Steve Potter has been collaborating with Guy Ben-Ary and Phil Gamblen at SymbioticA since 2002. He is a neuroscientist in the Laboratory for Neuroengineering at Georgia Tech, in Atlanta. His group works with networks of brain cells from rat embryos grown in culture dishes outfitted with 60 neural interfacing electrodes. 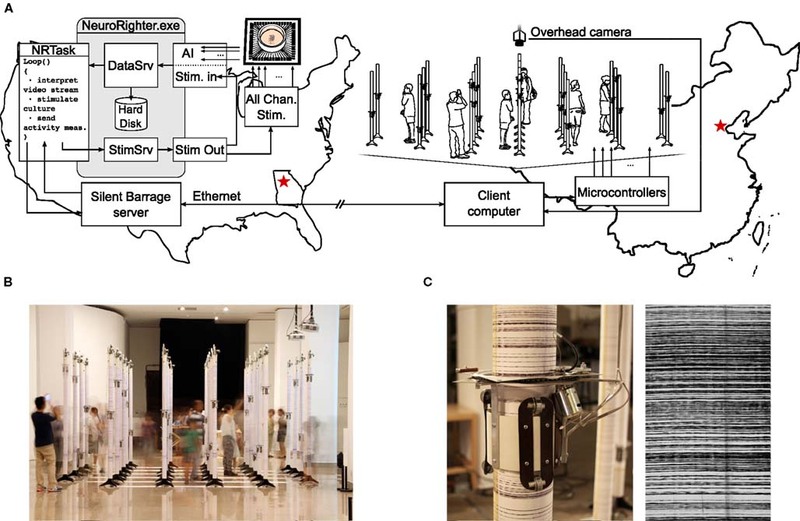 The multi-electrode arrays send sensory data into the cultured neural networks, in the form of electrical pulses, and read out the networks’ responses, which are used to control the movements of robots. With their Embodied Cultured Networks paradigm, the Potter group is studying learning and memory in a simplified animal, whose brain can be studied in detail under the microscope while its body is somewhere else doing the behaving. Potter’s lab is interdisciplinary, encompassing cell culture, multi-electrode electrophysiology, computer science, optical microscopy, and artificial intelligence. Potter got his bachelors’ degree in biochemistry from UC San Diego in 1987, and his PhD in neurobiology from UC Irvine in 1993. During his postdoctoral research at Caltech, he developed and improved tools for studying living networks, such as multiphoton laser-scanning microscopy, high-speed imaging of neural signals, and neural cell culture methods. He is an associate professor in the Coulter Department of Biomedical Engineering at Emory University and Georgia Tech, and teaches neuroengineering and neuroscience. The Potter group has developed hardware, software and techniques for training wetware with artificial sensory input, delivered to living nets via the multi-electrode array culture dishes.